İ am pretty busy nowadays. Same time İ am knitting and writing the instructions for a new knitting pattern: Keerpash Scarf. Dont't ask how on earth İ chose this name for this pattern... İt's the nickname of a friend of mine and it means small hedgehog in Turkish. İ took a pic with for this W.İ.P. (work in progress in knitter's language :) ... ) But İ am still waiting for a less cloudy day to take a better picture in order to show the lovely texture of this stitch pattern which somehow resembles the falling of last leaves late in autumn. My gauge was 17 sts x 23 rows for 4'' / 10 cm in Stockinette stitch with US 8 / 5.00 mm knitting needles. Even the pattern stitch looks complicated, it is actually pretty easy. İt only requires knit, purl, yarn over, k2tog, skp and centered double decrease stitches. İ am using a lovely yarn from Fibra Natura, Sensational Superwash 100 % Merino wool. İ love this yarn. İ am in awe. Each skein has 50 grams and İ guess 2 skeins will be enough for this project. My scarf has 5 '' width. 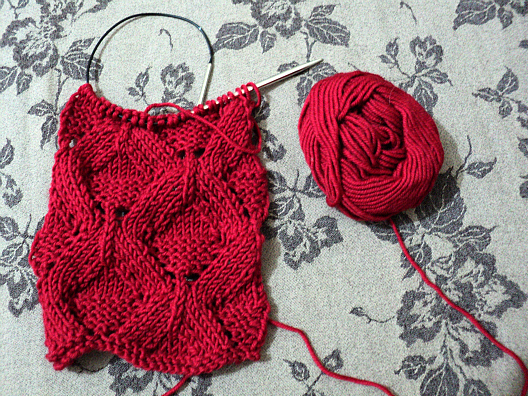 İ will include, as usual, instructions for a wider scarf. Always be aware that a wider scarf means more yarn!